phrases that may accompany typical display flights. These displays start with a steep climb, during which the wings are extended and the tail is fanned out, and they end with a gliding descent. The puffbacks may be seen for a few seconds during their short butterfly flights, made with their puff expanded. Most bush-shrikes are apparently sedentary, although local movements are obvious in a few species. Altitudinal movements have been recorded in the olive bush-shrike (Telopho-rus olivaceus) in Malawi and Zimbabwe. 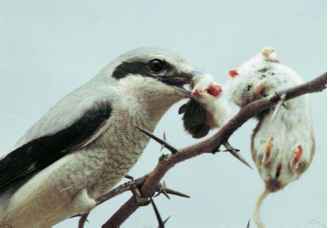 Eurasian red-backed and lesser gray shrikes may travel 6,200 mi (10,000 km) or more.